Be the first to share your favorite memory, photo or story of Vern. This memorial page is dedicated for family, friends and future generations to celebrate the life of their loved one. Petty Officer 1st Class, Vern Cecil Reynolds Sr. entered into his rest on Sabbath, October 6, 2018 at 2:05 a.m. of complications following an appendectomy at the Clinch Valley Medical Center in Richlands, VA. He was born in Whitman, WV on April 8, 1931 to James Franklin Reynolds and Elsie O’Brien Reynolds. 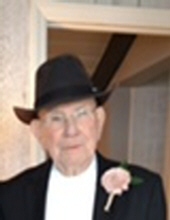 In addition to his parents, he was preceded in death by his lifelong sweetheart Elnor Jane Reynolds on April 24, 2015, Son-in-Law Steven Henry Beavers, Brothers Paul, Rudy, Lowell, Harold and Earl Reynolds as well as his sister, Marty (Toots) Jones. He graduated from Logan High School in 1949 and enlisted in the Navy in 1951, served in the World Famous Blue Angel Team assigned to the USS Antietam which was the first United States aircraft carrier that employed a “Canted Deck” and he was primarily a jet engine mechanic. He received his honorable discharge in 1955 where his Captain noted that he “Would be an asset to Navy if reenlistment were made”. He began his 33 year career in coal mining afterwards, married his sweetheart on April 26, 1956 and began building their family. Professionally, he was highly respected by his superiors and subordinates alike and while at times he and they might not necessarily agree on every point, somehow he had the ability to work with them effectively. For years afterwards, they said that they were to the better for having had the fortune of working with him and they thanked him for his leadership and guidance and ultimately, his friendship. His son, (Vern II), had the opportunity to work with him at two of his mines and was struck by the breathtaking care that he placed upon the lives and well-being of those entrusted to his responsibility and yet he managed to set records on a regular basis for production. Vern’s family was first and foremost the most important thing in his life and during the “lean years” they never suffered a lack of food, housing, clothing and other essentials but most importantly of all they never suffered a lack of nothing short of unconditional love. As a teenager, he had joined and was baptized into the Seventh-day Adventist church in Logan, West Virginia and recommitted his relationship to our Lord and Jesus Christ in the Richlands Seventh-day Adventist Church in December of 1987. As a member of the Richlands and later the Bluefield chapter, he wore many hats, most notably Head Elder and unofficially as Pastoral Assistant. Most assuredly his love and commitment to our Lord has secured his eternal life in God’s Kingdom. He is survived by his son Vern C. Reynolds II and daughter-in-law, Helen Mendiola Reynolds, daughter Lois Jane Beavers, grandson James Derick Reynolds and fiancée April Bell and her daughter Kristen Bell, granddaughter Karmelah Dawn Houston and grandson-in-law David Houston and great grand-son Ethan James Houston, granddaughter Krystal Dyan Brannon and grandson-in-law Robert Brannon and great granddaughter Eleanor Lois Brannon, step great grandson Devon Brannon, step great grandson Zachery Brannon, grandson Steven Henry Beavers II and granddaughter-in-law Jessica Smith Beavers and great grandson Chandler Matthew Beavers and great granddaughter Kinslee Harper Beavers, grandson Vern Curtis Beavers, granddaughter-in-law, Alexius Joyce Lawson Beavers, great granddaughter Grayson Alexus Beavers. Services for Vern Cecil Reynolds Sr. will be conducted on Wednesday, October 10th, 2018 at 11:00 a.m. following an hour of visitation at Singleton’s Funeral Service in Cedar Bluff, VA. Burial will follow at 2:30 p.m. at Highlands Memorial Gardens in Chapmanville, WV. As per the family, in lieu of flowers, please make a donation in his name to the Valley View Seventh-day Adventist church at 510 Adventist Road, Bluefield, WV 24701, or to the family. Online condolences may be sent to the family at www.singletonfuneralservice.com. Singleton Funeral Service is serving the Reynolds Family in their time of sorrow. To send flowers or a remembrance gift to the family of Vern C. Reynolds, please visit our Tribute Store. "Email Address" would like to share the life celebration of Vern C. Reynolds. Click on the "link" to go to share a favorite memory or leave a condolence message for the family.